These are also English documents, of course. So Baptists or Congregationalists who presently adhere to these respective confessions can trace their line, through Westminster, to the Articles of Religion of the Church of England and to their patristic and conciliar background. Is this recognised as it should be by those who presently adhere to these Confessions, I wonder? The Westminster Confession is English in another sense, in that it was the product of the Assembly which was called into being by the English Parliament, to whom it reported. Its first task was the revision of the 39 Articles. So whatever it came to confess on the church-state relationship, it was itself the child of an Erastian ecclesiology, and not of the assembly of any church. The Scots Commissioners (Rutherford and co.) were not members of the Assembly, and so had no voting rights. This is not to say that the Scots did not exercise a (disproportionate?) influence on the proceedings, partly due, Bob Letham seems to imply, to the political importance of keeping the Scots onside. (41-2) Most of the members of the Assembly were ordained ministers of the Church of England. But it failed to become the Confession of Faith of the Church of England. Its proposals were ‘dead in the water as soon as the Assembly made them’. (299 fn.16. Though according to Gerald Bray the Confession was legally enforced in England until the Restoration in 1660. (Documents of the English Reformation, (Cambridge, James Clarke, 1994, 486)) The Presbyterians were outmanoeuvred by Oliver Cromwell. The Scots appropriated the Westminster standards for the Church of Scotland, as did the emigrant Scots and Irish for their Presbyterian churches in the American colonies and elsewhere, the wording of the Confession being later modified for the new world of the American Constitution. Bob then introduces the reader to the working methods of the Assembly, both in its preparation of the Confession and the Catechisms, and in the earlier revision of the 39 Articles. He quotes extensively from the debate on justification in that earlier revision, the moving force of which was not a fear of Romish accounts of justification but of the rise of antinomianism in Commonwealth England, especially in London. The result of some of the debates that took place on the revision were carried forward to the construction of the Confession. In giving his account of the working of the Assembly, Bob particularly focuses on the fact that the members viewed their theological work with the background belief in the importance of the church catholic, citing patristic, medieval and Roman Catholic as well as other Reformed authorities as necessary, and of course, an abundance of Scriptural data. These reports of the debates also help to dispel romantic views of the working of the Assembly, as if the deliberations took place in a surreal atmosphere of unity and agreement. It seems that the Assembly had its share of windbags and bores, as well as the occasional wit, and there was much disagreement, and sometime serious confusion. Here the author relies on material that will form part of the monumental Minutes of the Assembly, (amounting to c. 850, 000 words), enlarged from the earlier published versions through the brilliant work of textual recovery of Chad Van Dixhoorn. These are to be published by the Oxford University Press in the not too distant future. On the aforementioned, lengthy debates on justification, I think Bob is being a bit easy on the participants. Viewed from this distance, they got themselves into the most enormous tangle because of their fondness for the distinction between the active and passive obedience of Jesus Christ. Some (fearing antinomianism) argued that we are redeemed only by Christ’s passive obedience, the passion and cross, others that we are saved also by the active obedience, his personal righteousness seen in his keeping of the law. Some said that we are justified by both. The Confession, when it came to be drawn up, in referring (in the chapter on justification) to Christ’s ‘obedience and death’, (XI.3) may have fudged the issue, or come down for the third option, depending on your point of view. But the distinction itself seems to be highly artificial, one distinction too far. For granted that the life and ministry of Christ is an expression of active obedience, who can seriously assert that his passion and death were passive? It is true that he was delivered into the hands of wicked men, but Christ went limp only when he gave up the ghost. Before that point, his entire ministry, culminating in that suffering, was a resistance unto blood, a striving against sin, an overcoming of the powers of darkness by his determination to do the will of his Father and to bring many sons to glory. To be an acceptable sacrifice, the victim must be spotless - holy, harmless, undefiled, and separate from sinners, implying an active course of law-keeping. So that the so-called active obedience is a necessary condition of the passive obedience, and so a necessary condition of that righteousness which is imputed to sinners. While there is a conceptual distinction to be made, I cannot see the wisdom of tying a theological issue to it, as the divines obviously did. 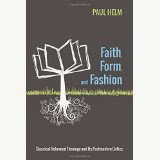 This brings us from the procedures and debates of the Assembly to the heart of the book, the author’s treatment of the finished theology of the Assembly, summarising the position on the Confession and the Catechisms, and entering into discussion with various revisionary proposals. In his exposition of the debates, besides his use of Warfield, he relies on the Van Dixhoorn material, and in offering his theological opinions on various matters he makes good use of two scholars of whom I had not heard, Edward D. Morris, Theology of the Westminster Symbols (1900), and Robert Norris’s 1977 University of St. Andrews doctorate. There are several excursuses which go into considerable historical detail. 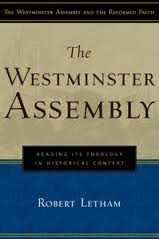 Bob Letham’s discussion of the theology of the Westminster documents is all well worth reading. He upholds the teaching of the Confession clearly and vigorously. He draws out the differing emphases to be found respectively in the Confession and in the Larger Catechism. Included in his remarks are criticisms of the Confession’s neglect of the love of God, his concern over divine impassibility, of the treatment of the Trinity, and of the person of Christ.Most though not all of his own criticisms of the Confession and the Larger Catechism have a pattern: the Assembly was not sufficiently sensitive to the ancient creeds and the doctrine of the Trinity. His rejection, in turn, of other criticisms, or readings, of the Confession, also have a basic pattern: they are the product of Vossian biblical theology, Kline (on the covenant of works), and Gaffin and others (on the ordo salutis), or of Torrancian misreadings. And though I don’t see eye to eye with all of these strictures, they are certainly correct both in their broad outlines and many of their particular emphases. They are to be applauded. The chief exception to this is Bob’s concern over the idea of the eternal pactum salutis, or covenant of redemption, which he thinks might easily subvert the orthodox doctrine of the Trinity and lead to tri-theism. But I think I’ll reserve my remarks on this for a future post. As one can glean from some of his other writings, Under Western Eyes (2007) and The Holy Trinity (2004), Bob is very exercised over the need to maintain the connection between Westminster and the historic creeds and the conciliar pronouncements of the undivided church.This is in order to counter sectarian tendencies, by maintaining the ideological ties with the primitive church, and so preserving the scaffolding of Christian unity, however scant the expressions of that unity presently may be. Perhaps occasionally he worries unnecessarily, as in the dim view he takes of the Assembly’s discussion of creeds (154-8) and the pains he takes to argue that the Confession upheld the begottenness of the Son. It certainly did. 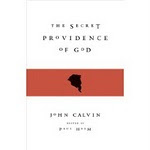 Nevertheless, it cannot be denied that, before the Confession, Calvin was unhappy about the Nicene expressions ‘Light from Light, God from God’, as implying a qualifying of the full deity of the Son, as were some later Reformed theologians. And when all is said and done, however hallowed they are, the ancient creeds, as the Confession itself, mist be subordinate, corrigible theological authorities. The Westminster delegates had the healthy concern not to make it appear that such documents had parity with Scripture itself. As for the debates on baptism, any Baptist who is otherwise in sympathy with the theology of the Confession may be excused a wry smile or two: dipping or sprinkling? Or either? Regeneration with baptism, or not? In what sense are the children of believers ‘holy’? The baptism of children of ungodly parents, yet in the line of the covenant: valid or invalid? Here were knots that the delegates manifestly failed to untie. You may already have gathered from all of this that Dr Letham’s new book is a most welcome addition to the literature on the Confession, and on Reformed theology more generally, being both instructive and thought-provoking. Both Letham kindly read a draft of this review. As a result I have had a go at expressing his thought and my comments more clearly.